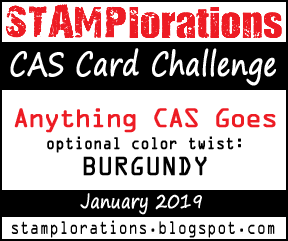 Happy New Year guys, today is the first CAS card challenge of 2019, the theme is as always anything goes, but the optional color twist is Burgundy. I put together my DT project using one stamp set and one ink pads, simple and easy to do. I stamped all of the images from the House Extras stamp set using a Burgundy water based ink pad. I then used a water brush to pull the color out and add some shading. In some places I created a wash of color. I love how this card turned out, it reminds me so much of the picture in the Charlie and Lola books by Lauren Child, my children loved them when they were little.